Last week, we wrapped up our Striv Summer Workshops in Henderson, Nebraska, hosting over 16 Striv Schools from around the state. We had teachers, faculty members and students in the house to learn and grow in media education. Our workshops focused on 5 main topics: How to start a New/Digital Media Class, training in Social Media, Snapchat and Instagram, training in Adobe Photoshop and Premiere, and we finished with Broadcasting, Podcasting, and Wirecast. The workshop brought forth great dialogue and thought-provoking questions. Teachers and faculty shared ideas, gave advice and cultivated conversation about how they operate their digital media class. For example, Lincoln Christian shared their curriculum of grading, explaining how their class is project-based, where students write out their goals, think about the apps they will use to complete their projects, and set personal deadlines. Alma High school also shared their class format, explaining how the class is uniquely invitation only. The day continued with the next session focusing on the importance of Snapchat and Instagram. Our goal was to teach the basics of these social media apps, while diving into the important details. Taylor walked through the great features of an Instagram story, the importance of hashtags, using taglines, and how to upload a video or photo to a school’s Instagram page. Snapchat was next, with instruction on how to create and use a geofilter and how to create a personal ‘My Story.’ With Instagram and Snapchat serving as two of Striv’s main avenues of sharing stories, it was great to share our experience and learn from teachers on how they are incorporating social media into their school and allowing students to be digital social media leaders. Training in Adobe Creative Cloud followed with Austin Penfield, Striv’s Photoshop GuRu. 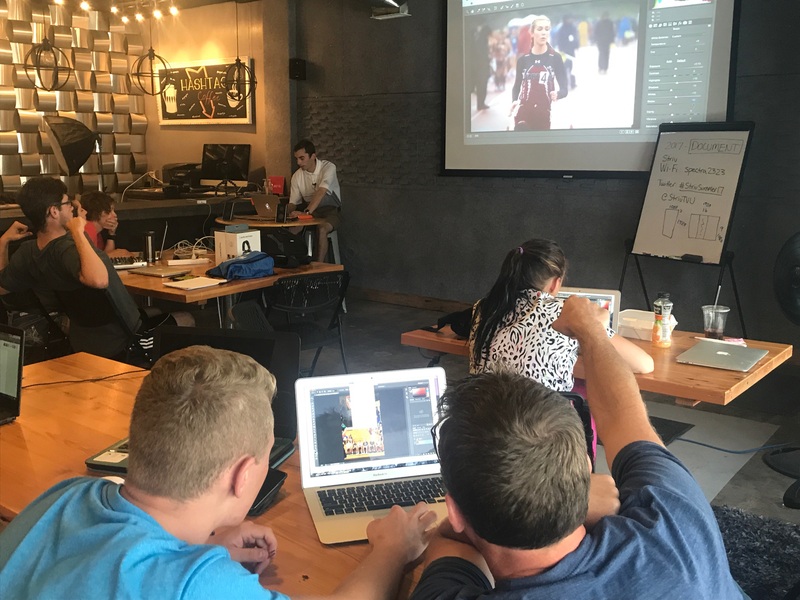 He taught each workshop the basics of creating and editing content in Photoshop: Things like touching up photos, adding shapes and text to a photo, working with smart objects and rasterized layers and the different tools and shortcuts of the software. Teachers and faculty were then able to give it a try themselves in a hands-on experience of all editing the same photo with Austin’s guidance. This session allowed the Striv team to brainstorm and think of ways to better help students and teachers feel confident and well-versed with Photoshop. There was no doubt that the Adobe Creative Cloud is a tool students and teachers are eager to learn about. Striv Sports Director, Eric Allgood finished the workshop by sharing his expertise in podcasting, sports broadcasting, and wirecast. He walked through the basics of Audacity, the audio software for multi-track recording and editing. He also provided discussion on how to record, make cuts and edits, how to help students use their microphones, headsets, etc. and added a plethora of resources for teachers to help students hone their craft. Eric covered a frequently asked and key question: “What students do I recruit to do Sports Broadcasting?” While every student is capable of learning the tricks of the trade, he encouraged the workshop to recruit students who are singers, in one-acts, passionate about speech and even athletes who are currently injured. Eric shared his ‘teacher tips’ stating, “It’s always about the story!” He shed light on how to encourage students to learn about the game, use sports broadcasting lingo, and how to write-up coach and student interview questions. It was exciting in this session to have the teachers, faculty, and students of the workshops share personal experience, advice and ways to encourage other schools and help Striv to better equip students in becoming confident and diligent sports broadcasters and podcasters for their schools! Our 2017 Summer Striv Workshop was a great experience for the entire Striv team. It was an honor to have schools travel to Henderson to learn, share, and grow in media education. We are so excited for the upcoming school year; new and improved things are on the horizon for our Striv Schools!